It was the busiest day yet at the Special Olympics World Summer Games in Abu Dhabi today as action took place in 18 different sports. 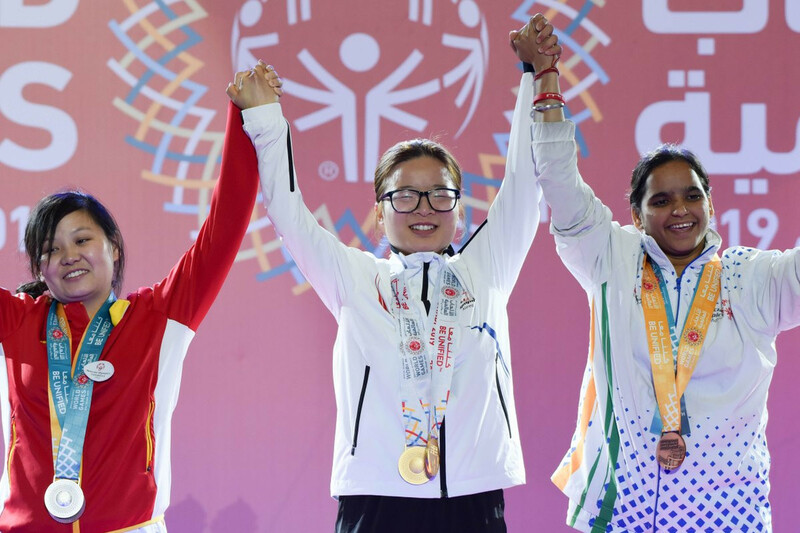 Medals were decided in athletics, badminton, equestrian and powerlifting among other sports and in the 100 metre athletics discipline alone, 36 different finals were held. The first race was won by Chinese Taipei’s 14-year-old Wen Chieh Chuang in 15.48sec, with the last, more than two hours later, won by Saudi Arabia’s Mohammed Alrefai in 11.32. Of all 36 races at Police Officers' Club Stadium in Dubai, that time from Alrefai was the fastest. He won by nearly half a second from Libya’s Ala Furawi, while Jamaica’s Obrian McFarlane came third in 11.86. A further 15 golds were handed out in men’s singles badminton, while another 14 were distributed across the women’s singles. Indonesia’s Riswida Wijayanto was among the winners in the men’s event after finishing Division One* Group A unbeaten. Sara Mashabek's love of horses is so strong that sometimes she tries to ride more than once a day! At 10 years old, she is putting her knowledge of the animal to the test as she competes in equestrian! He won all three of his matches to seal the gold medal at Abu Dhabi National Exhibition Centre. Mohammed Abdul Kader Soron from Bangladesh won Group B to gain gold, while later in the day Mihaly Csonti scooped gold for Hungary by finishing first in Division Two Group D.
At Al Forsan International Sports Resort, one of several dressage golds in the equestrian events went to Switzerland’s female rider Chantal Meyer. Another was won by Denmark’s Marie Vielsoee-Nielsen, who is just 16. Meanwhile, in the powerlifting, which like the badminton also took place in the National Exhibition Centre, medals were decided in the bench press, squat and combined bench press, squat and deadlift disciplines. Among the winners in the bench press was Canada’s Andre Gerhard Goulet, who won the men’s M20 division with a lift of 135 kilograms. No one lifted heavier than that all day. On the women’s side, Michelle Athenas from the United States won the F15 event with an effort of 62.50kg. Tomorrow action will take place across 16 sports.